Polystyrene Car for DIY The polystyrene car is used to set up shop windows, but it is also used as a decoration for a child's bedroom. Widely used also in the cake design sector as a decoration for parties. 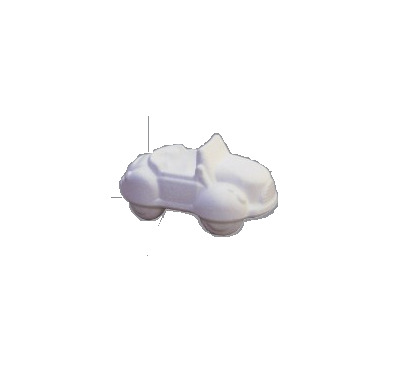 Our company offers the polystyrene car that measure 6.5 inches high and 7.75 inches wide. The car is a polystyrene shape ideal both in the art of cake design as a decoration for monumental cakes, and as a template to set up shop windows for toys or as a bedroom decoration. 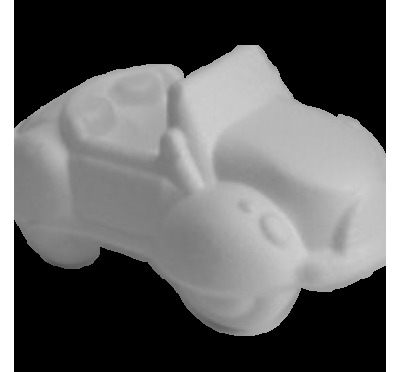 The polystyrene car for DIY is the mould most requested by all those who own a toy store or for decoupage lovers. The car, in fact, is especially used as a showcase decoration or for a child's bedroom. The polystyrene car can also be an embellishment for a class of elementary or maternal, to make the environment more colourful and stimulating for children. The polystyrene car for DIY can be decorated in many ways, depending on the circumstance in which you want to use. In fact, once coated with the vinyl glue on the polystyrene shape it is possible to cover the entire surface with glitter, paper for decoupage, rhinestones and even with some fabric. The polystyrene with which the car is made, in fact, allows an easy adherence of every type of material. This decorated mould can also be an excellent gift idea. Making a decorated object to donate is always a very nice gesture, appreciated by everyone as it shows the commitment the affection and the ability of those who made it. The polystyrene car for DIY manages to involve adults and children and stimulates creativity. The shape of the car form can also be used in the food industry as a cake decoration. In fact, the pastry chefs skilled in the art of cake design can use the polystyrene car form to decorate birthday cakes. Just covering the car form with sugar paste or fondant past, the decorated car form can be used as a cake embellishment for various celebrations, such as a birthday party for a child. The mould representing a car shape to decorate Birthday cakes, stimulates pastry chefs and lovers of cake design to create real masterpieces in sugar paste. Often it is possible to find this shape of car as a decoration for cakes even on top of dummy cakes, or fake cakes. These fake cakes are entirely made of polystyrene coated with sugar paste and serve as a display for confectionery showcases and cake design resellers. The polystyrene that composes the shape of the car is of excellent workmanship and totally hygienic, since it is a highly insulating material and does not allow the formation of bacteria. For this reason it can easily be used in the food sector without this entailing health risks. Furthermore, being extremely durable it is very durable and allows you to keep this mould for a long time. The car in polystyrene is of excellent quality. Our company with years of experience in processing polystyrene and sophisticated hot wire machines for precise and accurate cutting offers a wide choice of sizes. Our catalogue of cars, in fact, allows you to buy a polystyrene car of 6.5 inches high and 7.5 inches wide.